Robert H. Schoen, 87, of Beatrice died at his home after a short battle with cancer on Thursday, February 7, 2019. 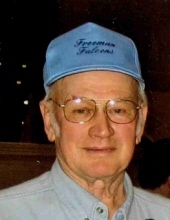 He was born on February 18, 1931 at rural Pickrell and at the age of 12 his family moved to rural Adams. He graduated from Filley High School in 1948 and started farming with his dad. He was a 4-H member winning many awards and had the Grand Champion beef in 1948 and Grand Champion showmanship in 1951. Robert served in the U.S. Army as a medic and ambulance driver in Korea from 1952 – 1954. He married Anora Busboom on June 27, 1954 at Christ Lutheran Church of rural Pickrell. They were blessed with four children, Russell, Denise, Burdette, and Andy. He was Gage County’s outstanding young farmer in 1964. Robert was a life-long member of Zion Lutheran Church of rural Pickrell where he held many church positions and belonged to Lutheran Men in Mission. He was a Director of Western United Insurance of Wilber for 20+ years and was also a member of the Bitting-Norman Post #27 of the Beatrice American Legion. He loved farming but also enjoyed fishing, hunting deer, bowling, and attending sporting events for his children and grandchildren. Survivors include his wife, Anora of Beatrice; daughters, Denise (Larry) Boardman, and Burdette Schoen all of Lincoln; son, Andy (Patty) Schoen of Adams; daughter-in-law, Gail Schoen of Beatrice; nine grandchildren, Aaron (Kylee) Schoen, Anthony (Lindsay) Schoen, Sabrina (Josh) Glynn, Ciera (Ben) Semlak, Katie (Bryce) Arp, Bridget Murkle, Kyle Schoen, Holly Murkle, and Hannah Schoen; nine great-grandchildren, Elizabeth Patterson, Nora Glynn, Kenley and Kace Schoen, Kolton and Ava Schoen, Gauge and Maksym Semlak, and a soon to be baby Arp; five step-great-grandchildren, Connor Semlak, Austin Baldwin, Kaden, Rylee, and Tayler Glynn; sister, Geneva Parde of Adams; four sisters-in-law, Marie Schoen and Marlene Busboom both of Adams, Betty Buss of Beatrice, and Rosie (Kenny) Miller of Adams; one brother-in-law, Ronald (Verla) Busboom of Cortland; many nieces and nephews. He was preceded in death by his parents, Henry and Katie Gronewold Schoen; son, Russell (1996); grandson, Phillip Schoen (2013); brother, Arnold Schoen, parents-in-law, Ehme and Jennie Busboom; three brothers-in-law, Gerald Busboom, Gerald Buss, and Wilfred Parde. Funeral services will be held at Zion Lutheran Church of rural Pickrell at 10:30 A.M. on Monday, February 11, 2019 with Pastor Jerry Gilbreath officiating. Burial will be at Zion Lutheran Church Cemetery of rural Pickrell with military rites conducted by Bitting-Norman Post #27 of the Beatrice American Legion. A family prayer service will be held at 10:15 A.M. on Monday at the church. A memorial has been established to the Zion Lutheran Endowment Fund with Myron and Ruth Schoen in charge. The body will lie in state at the Fox Funeral Home from 12:00 noon to 8:00 P.M. on Saturday and Sunday and at the church one hour preceding the services on Monday. The family will meet and greet friends and other relatives on Sunday at Fox Funeral Home from 5:00 P.M. to 7:00 P.M. www.foxfuneralhome.net Fox Funeral Home of Beatrice in charge of arrangements. To send flowers or a remembrance gift to the family of Robert H. Schoen, please visit our Tribute Store. "Email Address" would like to share the life celebration of Robert H. Schoen. Click on the "link" to go to share a favorite memory or leave a condolence message for the family.